Dialect variation brings together language synchrony and diachrony in a unique way. Language change is typically initiated by a group of speakers in a particular locale at a given point in time, spreading from that locus outward in successive stages that reflect an apparent time depth in the spatial dispersion of forms. Thus, there is a time dimension that is implied in the layered boundaries, or isoglosses, that represent linguistic diffusion from a known point of origin. 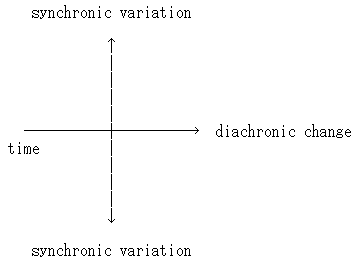 Insofar as the synchronic dispersion patterns are reflexes of diachronic change, the examination of synchronic points in a spatial continuum also may open an important observational window into language change in progress. Although dialect diffusion is usually associated with linguistic innovations among populations in geographical space, a horizontal dimension, it is essential to recognize that diffusion may take place on the vertical axis of social space as well. In fact, in most cases of diffusion, the vertical and horizontal dimensions operate in tandem. Within a stratified population a change will typically be initiated in a particular social class and spread to other classes in the population from that point, even as the change spreads in geographical space. ・ Lightfoot, David. "Grammaticalisation: Cause or Effect." 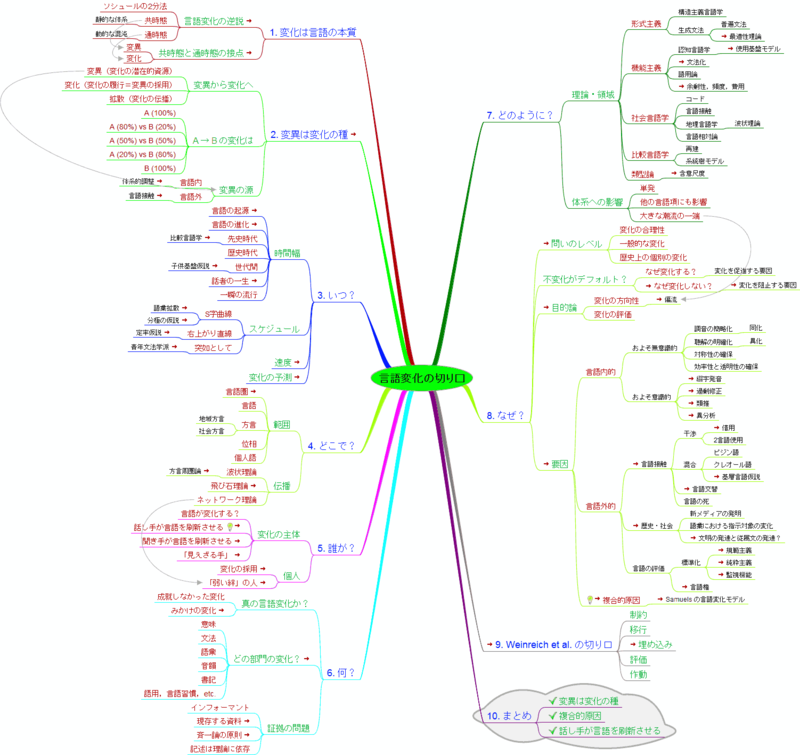 Motives for Language Change. Ed. Raymond Hickey. Cambridge: CUP, 2003. 99--123. Human beings are social creatures, and not simply transmitters (speakers) or receivers (hearers); they are both. When humans speak, they are not only producing sounds and grammar and vocabulary; they are also monitoring what they and others say by listening, and evaluating the communicative efficiency of their speech for the purposes for which it is being used: communicative purposes which are not only to do with the conveying and receiving of information, but also to do with such matters as signalling the social circumstances of the interaction taking place. And what humans hear is constantly being monitored, that is, compared with their earlier experience as speakers and hearers. . . . / This principle of monitoring, or feedback as it is sometimes called (Lyons 1968: 111), is crucial to an understanding of language-change. ・ Croft, William. "Evolutionary Models and Functional-Typological Theories of Language Change." Chapter 4 of The Handbook of the History of English. Ed. Ans van Kemenade and Bettelou Los. Malden, MA: Blackwell, 2006. 68--91. [T]hese habits are composed of (1) the adaptations and phonetic renderings that were conventional in the French use of book-Latin words round the year 1200, (2) adaptations that have become conventional in the English usage of Latin-French forms, and (3) phonetic renderings due to English sound-changes that have occurred since the Norman time. At any moment between the initiation and the conclusion of these changes we have a state characterized by the presence of more or less free variants, so that the speakers have the choice between alternative expressions. In each case the choice will be determined by an interplay of factors, some linguistic, some esthetic and social, an interplay so complex that most often the choice will appear as being due to pure chance. At any moment of this long period the French phonemic system would have to be described in such a way that the relations between these variants would be accounted for, because, in my opinion, these relations, however complex they may be, are themselves part of the system. What therefore in the history of a linguistic system appears as a change will in a synchronic description appear as a more or less free variation between different forms of expression, equally admissible within the system. Let it be added that this statement cannot be reversed: every free variation within the system will not, in the time dimension, correspond to a change. It is important to stress this aspect of systems, because without admitting a fair latitude of variation within a system, it is difficult to see how structures could change at all. ・ Vogt, Hans. "Contact of Languages." Word 10 (1954): 365--74.